Clarksville, TN – The weather, which has been so abrasive these last few months, turned pleasant on Monday morning as people made their way into the Austin Peay State University Music/Mass Communication Building. Instead of lingering under that clear, warm sky, hundreds of well-wishers eagerly filed into the windowless Mabry Concert Hall to watch Dr. Alisa White officially become the University’s tenth president. For more than 400 years, American colleges have honored the formal transfer of leadership with presidential installation ceremonies, and Monday’s event continued this tradition with a celebratory atmosphere. The University’s Department of Music set this tone with several moving musical performances, and members of the APSU and Clarksville-Montgomery County communities extended the festive mood by speaking optimistically of White’s coming tenure. “I can graduate in May knowing that this University and my fellow students are in great hands, and I know this University is on the verge of something great,” Zac Gillman, APSU Student Government Association president, said. Col. David L. Dellinger, garrison commander at Fort Campbell, attended the ceremony to reassure the public that White is still committed to supporting the area’s military community. Several dignitaries from colleges and universities from across the country also attended the event, including Dr. Jesse Rogers, president of Midwestern State University in Texas. White had served under Rogers as provost and vice president for Academic Affairs at that institution. He was one of the individuals who nominated her for the APSU position, and he offered White a challenge during her installation ceremony. “Dr. White, the charge that I deliver from the education community is to dedicate yourself to the ideals of free inquiry, open and responsible debate, diversity and academic excellence; to encourage the advancement of the cornerstones of university education—the arts, the sciences, the humanities and the social sciences—and to cultivate peaceful resolution of conflicts and respect for differences,” he said. John Morgan, TBR chancellor, performed the investiture, but before asking White to repeat after him, he explained that university presidents play a critical role in Tennessee’s higher education community. White was selected as Austin Peay’s tenth president after an extensive nationwide search that resulted in four finalists visiting campus. 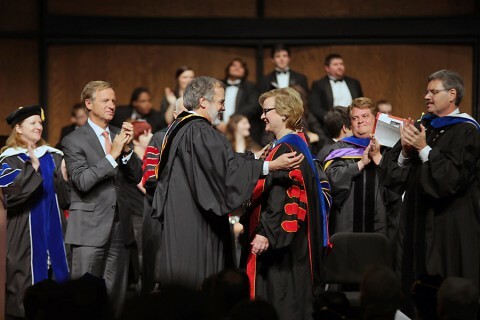 She arrived at APSU on June 30th to begin her tenure as president, and her husband Elliot Herzlich soon joined her from their previous home in Texas. Monday’s ceremony ended with a reception in the lobby of the MMC Building, and a surprise performance by the APSU Governors’ Own Marching Band.